Founded in 1976, Elliott Dudnik + Associates is a full-service architectural firm based in Evanston, Illinois, providing architectural, planning and engineering services. Experienced in the design of new, and the renovation or adaptive-reuse of existing, buildings our firm has provided these services for many projects in both the private- and public-sectors, incorporating a broad range building types. Our services encompass the entire building process from needs assessment, programming, and site analysis through design and the preparation of construction documents to construction administration. We also focus on the preservation and restoration of buildings, as well as assisting clients in the repair or reconstruction of construction failures, collapses and building deterioration. We utilize these same professional skills and experiences, coupled with our academic backgrounds in architecture, engineering and planning, to provide expert witness, forensic analysis and other litigation support for legal actions associated with construction-related failures or errors, building code violations, and any related personal injuries, property damage or financial losses. 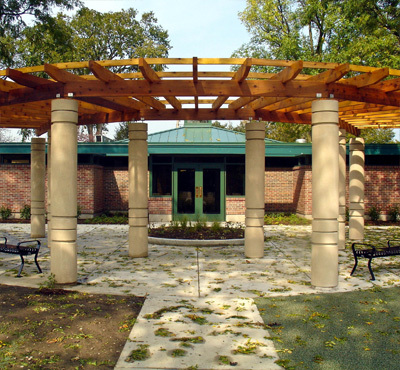 Recent and past public work includes multiple projects at The Adler Planetarium in Chicago and the Evanston Police Headquarters, the design of the Evanston Fire Headquarters, renovations to the Evanston Civic Center, Noyes Cultural Arts Center, Fleetwood-Jourdain Community Center, Evanston Arts Center, and both the Wilmette Water Treatment Plant and the Wilmette Storm Water Pumping Station, as well as many recreation or park projects in Evanston, including the redesign-reconstruction of Mason Park and the Mason Park Fieldhouse, the Lakefront Lagoon Building, and the Dempster Beach Building. Commercial projects have included the John Burns Construction Company Headquarters, the Merit Insurance Headquarter offices, the Union Pizza, Tommy Nevins, Campagnola and Tapas Barcelona restaurants in Evanston, and a number of medical or professional offices, day-care centers, and retail or industrial facilities throughout the Chicago area. Residential projects have included both new homes and additions to or renovations of single-family residences, multi-family townhomes, and mid- and high-rise apartment buildings. The City of Chicago, the City of Evanston and the Village of Wilmette have recognized a number of our historic residential renovations or additions with preservation design awards. Similar recognition has been accorded to several of our commercial and public building projects in the form of awards for architectural design, historic preservation, restoration, and urban design, as well as by inclusion in professional journals or other publications. Licensed in several states as well as holding NCARB certification, we are also LEED Accredited Professionals and members of many professional societies.